Today, we talk about the institutional political situation in Italy, the Italian economy, the spread and BTP trends in Italy. The analysis and themes recently discussed by Michele Geraci have been several; themes that particularly concern the comparison between China and the rest of the world, the Chinese economy and the green economy, the China Manufacturing 2025 plan. Many of his articles and themes have also been posted by Beppe Grillo, on his blog, by the 5-stars movement, moreover, Professor Geraci also provides advice to Matteo Salvini, Leader of Lega party. Today, together with Michele Geraci, we would like to understand what is happening and what will happen to the performance of the Italian economy and to our accounts. When talking about the spread, we must remember that this word is quite recent for our country (about 7 years) and we must look to the following equation: a low spread means more savings for the State and citizen’s income is capped, basically a transfer of wealth from private sector to the public sector. On the other hand, a high spread means a transfer of wealth from the State to the citizens and if bondholders are domestic investors that increase domestic income. I tend to have a more neutral perspective, there is a range of numerical values in which a value of a ten-year yield is fine, on the contrary, if it is too low it’s not good, because when the rates are almost zero, it means that the cost of money is too low, and it invites investments from companies whose business plan is marginal. When the cost of the money is low, it creates an imbalance, which doesn’t attract the industry sector we are interested in, namely, reliable firms with long-term investment programs, but firms that are less reliable and with short-term investment programs. Low rates create a misallocation and this generates two main problems: firstly, citizens do not get any revenue and secondly, capital is allocated in an inefficient way, these are issues paid in the long run. In the short term, there is the illusion of low prices and pseudo-investments, but then, in the long run, it the bill arrives. So, I think that a ten-years at a rate of 4% don’t represent a dramatic situation. Even in recent years, we have been used to have rates of 4/5%, problems arrive when they are above 6/7% or below 1. Now we are in a quiet area, in addition, we have to look at the composition and nationality of the investors. This institutional crisis raised the spread between Italian BTP and German bunds, but there is some fund of truth in this increase, and we saw that after the President’s choice to nominate Cottarelli, we had a change, a quiet of spread, and a bottom of truth compared to what was the intent of the two forces that were preparing to govern with respect to their economic program, which did not seem to take many accounts of our debt situation or hoped for very complicated solutions to treat or retract with Brussels . What is your first impression? I believe that these values do not represent dramatic changes. These are minor signals. Even a transitional government, with possible elections in autumn, wouldn’t change the general situation, and usually, the markets tend to anticipate events. The program of the two parties was perhaps described in a catastrophic manner by the media, but I tend to be more positive, as things usually never happen as they are foreshadowed. One of the factors influencing performance is the debt-to-GDP ratio, I have noticed that during the last weeks the media discussions have mainly focused on the debt hedging ratio, so the debt-to-GDP ratio, concentrated on the increase of the debt and the following increase of the spread. However, little has been said about the policies which could have been implemented in order to increase the GDP and to halt the ratio deterioration. Therefore, in the next few days, it is necessary to look at the debt / GDP and see if these expenses lead to an increase in GDP. I’ve tried to look at both these two components, debt/GDP, and to fill this gap by paying more attention to the possible increase in GDP. Salvini and Grillo have looked closely at your articles on the China model, on the green economy and China manufacturing 2025 plan, which is inspired by a new technology-based challenge model. How can Italy take inspiration from China and how much have these two leaders been inspired by your analysis? -> Salvini was interested in how the Chinese growth of the GDP (9.5% for 40 years for 1.3 bn people) was achieved, inter alia, on 5 fundamental control pillars. These 5 pillars were used as necessary by loosening or tightening the grip, with a policy that was neither liberal nor protectionist. The central message is the fact that China, one of our competitors, works in this way and we should learn how to adapt our strategies. We must, therefore, decide as a country system if we want to compete with China and how to do it. We talked about tariffs, Italy does not have total control on tariffs because it is part of the EU, so we cannot change the tariffs on Chinese products, but we still have to go to Brussels to figure out how to handle the European tariffs. Moreover, each country has its own products’ tariffs to negotiate with China, so it is necessary to return to the negotiating table. 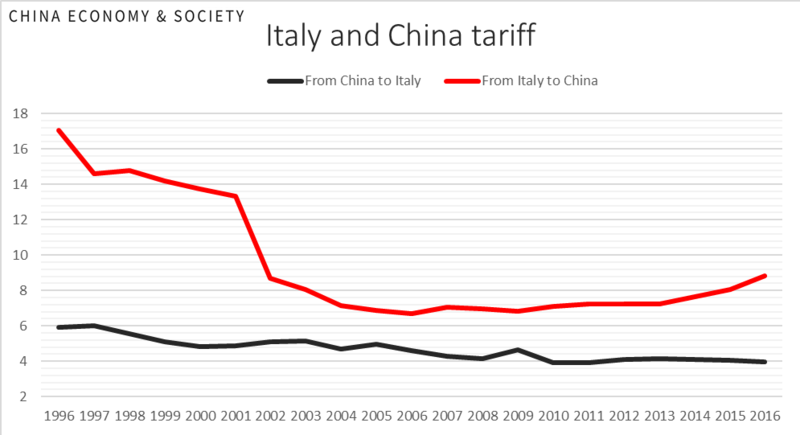 Just a couple of days ago, I published an analysis that shows how the export of Italian products to China suffered for an increase in tariffs. ->, On the other hand, Grillo is interested in the future. What China can teach to Italy about its green energy development initiatives, a theme close to Grillo’s heart. He is also interested in learning about the Chinese rural economy. One/two documentaries that I filmed in China are now on Grillo’s blog and describe the situation of the farmers and the rural economy. We can, therefore, summarize by saying that the Lega-5SM’s challenge on the issues of debt/GDP could be helped by less oppressive fiscal policies than those that we have today, on the other hand, attention is also concentrated on a reconversion of the industry towards a green economy and special attention is paid to Italian agriculture. We should look at how to re-establish our industrial model, the pollution, and our social values. Perhaps China, a communist country, is also reminding us of these values. We are in the middle of an ideological challenge, between commercial liberalism and protectionism, but it is still not clear what is the option which can better benefit our citizens. Should a country maximize the average wealth of citizens or minimize the losses of the poorest? Does a country have an internal system of redistribution of income that could favour both of these goals? Italy does not have, but China does have. Talking about immigration, we should remember that the economic growth of the Chinese cities also relies on migrants coming from the countryside. In this case, it is important to say that the Chinese are planning migration flows with great attention to details. The system works as if it were a board of directors, with specific targets for each of the provinces. To go back to the topic of the denominator and the GDP, China invests in research and development, it is clear that this positively influences the GDP. The classical schemes seem to be put into questions, and the 5-stars movement and Lega are taking inspiration from totally different models, in order to adapt them to the Italian context. We are in a very positive turn of events; as a non-politician, I can say that I have to transmit these pieces of information without ideologies. We must see China as a challenge but also as an opportunity and I hope that the next governments can face the challenges, but above I hope that it will be able to do not miss out on the opportunities. I’ve been suggesting, for some time now, cooperation with third parties in Africa, where China invests and where I think Italy should be part of the system, other countries already do it. Moreover, having a strong foreign policy is an important topic to address, right now. The domestic and foreign policy must be considered together. During these last 3/4 years, with the diplomatic network that has been created through the embassy and consulates, we are beginning to glimpse the new China, which is no longer that of a few years ago.